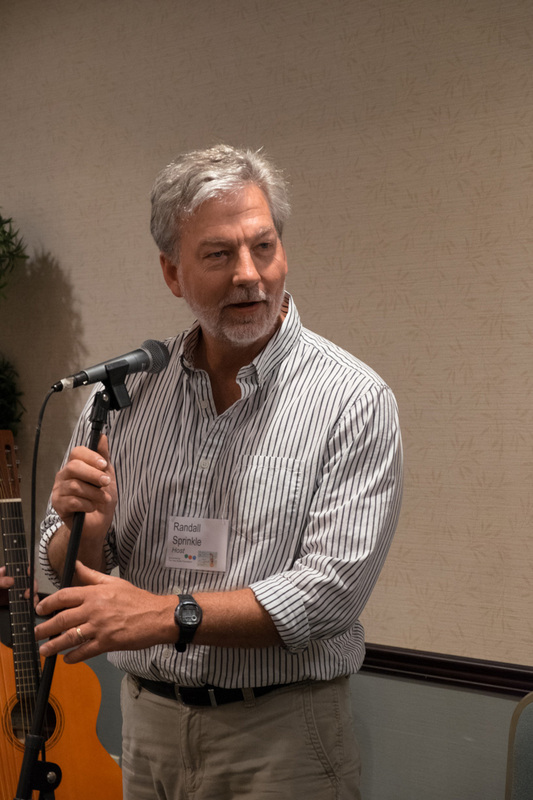 If SB and I took cuts in the dinner line (and I’m not saying we did), it was because we had to finish so we could get the evening’s festivities going with our first-time host, Randall Sprinkle! After the introductions (including announcing the next two Gathering dates), we got right into our Open Mic party. 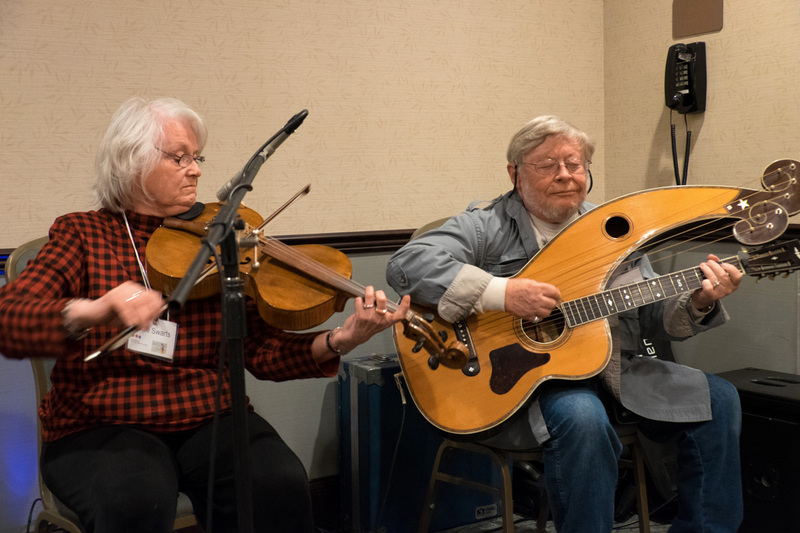 Perhaps the best we’ve ever seen – I think every new attendee played for the group! 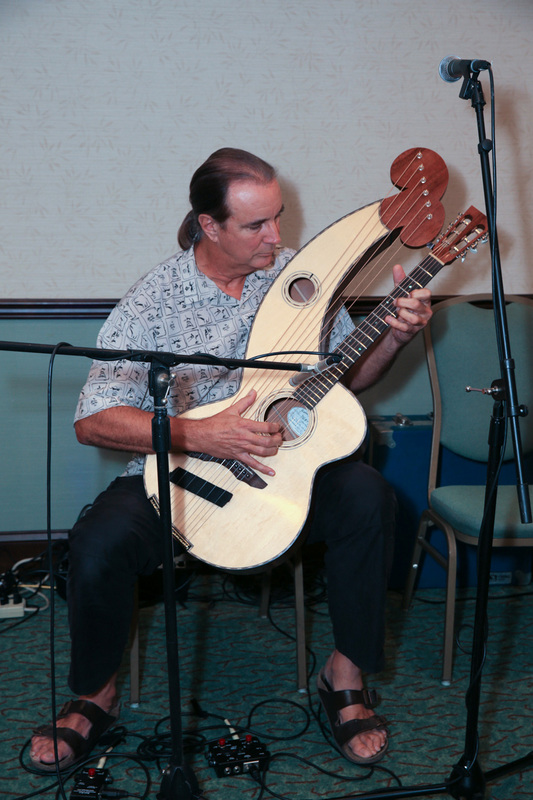 The following photos are by our own CHGP (Certified Harp Guitar Photographer) Chuck Thompson. Andy Wahlberg led it off, playing one of his instrumentals on a borrowed brand new creation by fellow Floridian Bill Martin. It’s a prototype “Reverse Tension” (patented!) harp guitar – something Andy convinced Bill to try and bring to our event. It made quite a splash, and I’m hoping we hear more on it in the future. 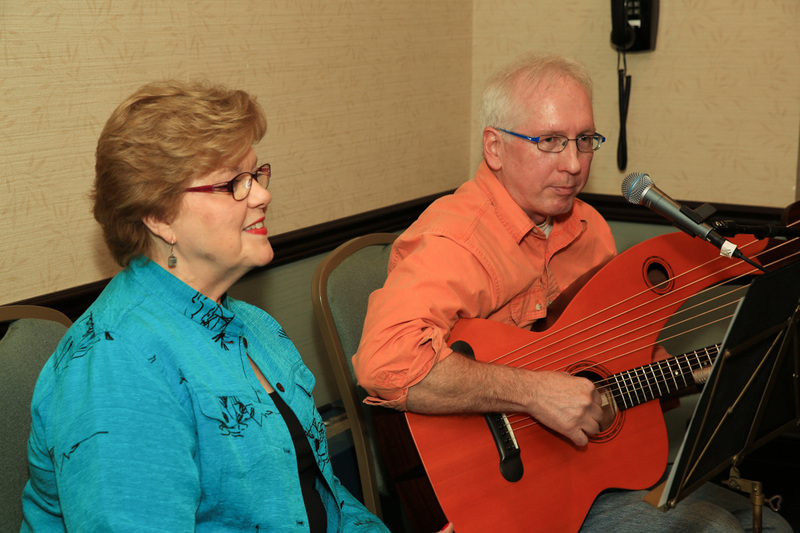 This is the second Gathering in a row for new HGG family members Tom & Mary Pat Cook. 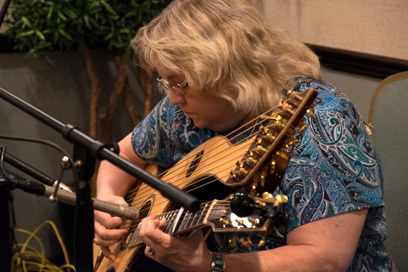 This was a rare time we let a 6-string in, so that Mary Pat could proudly back up Tom on his elaborate Worland. Another return HGG-er was Stephen Bekessy and his wife Marie. 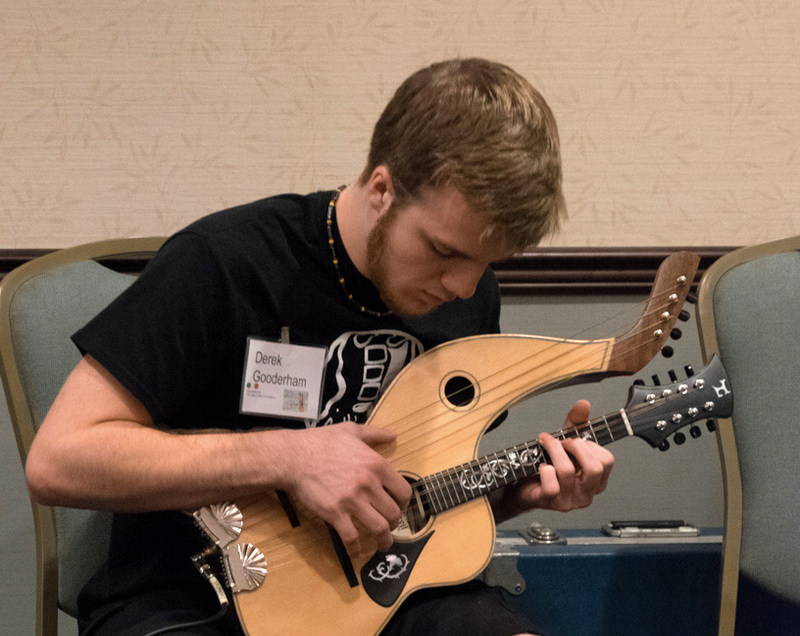 Stephen rocked out a fair bit on his Buckey HG. 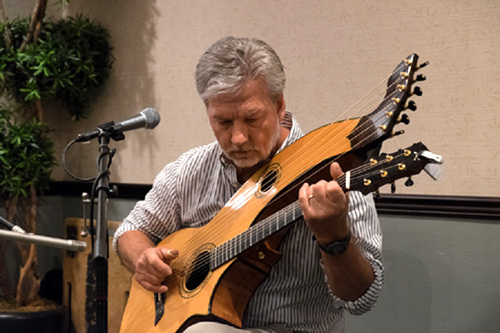 Frank Doucette (with his Wingert HG#1) always has a terrific new arrangement for us. This year it was a harp guitar arrangement of a 6-string piece by UK fingerstylist Ben Powell. The whole Gooderman family attended their first Gathering! Young Derek has the bug bad – he brought three instruments: this early Holloway, and two custom Tonedevil creations. His dad John played guitar and sang some serious lead vocals; he was surely in some Classic Rock bands in his own youth as the guy had some pipes! 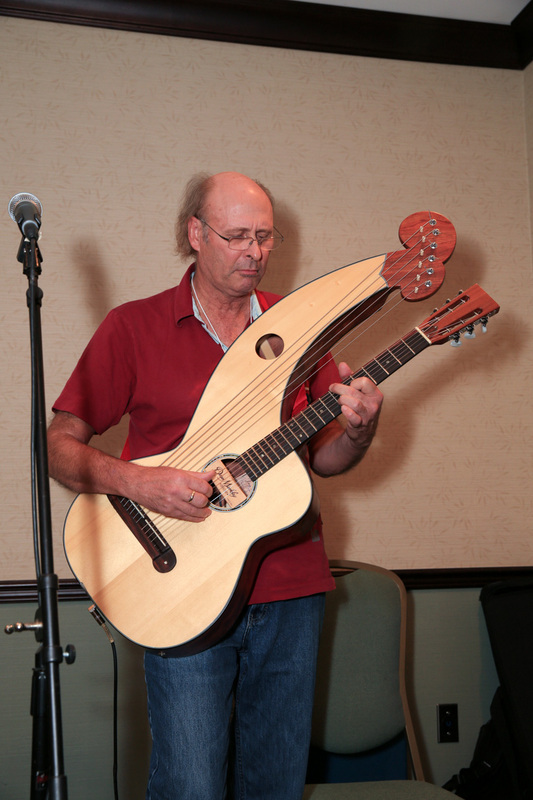 Later in the evening, Derek came back and played an original piece on his Tonedevil harp mandolin. 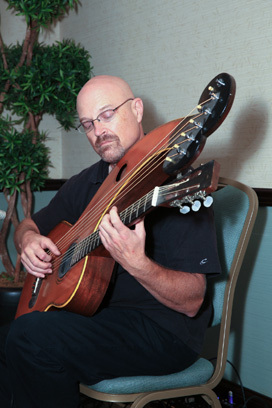 Another Newbie, luthier Neil Harrell. He showed up with a Buckey HG while he prepares to build his own. The ever popular Dan & Bets! Dan plays his old Dyer 7, but Bets had a new surprise – a stunning 1800’s octave violin that they’ve dubbed “Fidzilla.” It leveled the town of Moorseville. 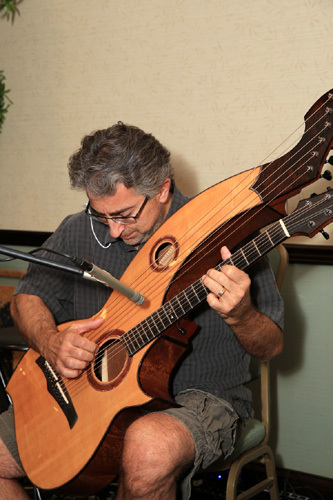 Luthier Tony Karol from Canada plays harp guitar almost as well as he builds them. 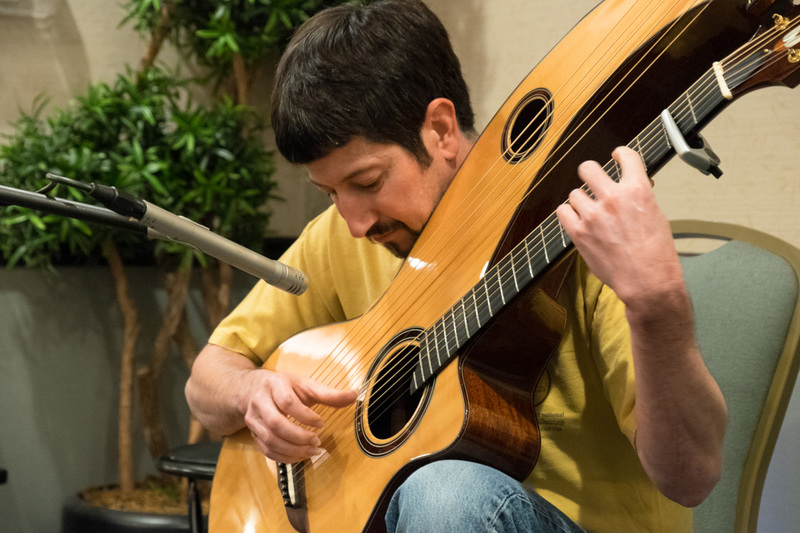 Here he plays a Bennett piece on (naturally) a Karol. My brother Mark (on his New Dyer with his wife Barb on drum) surprised me with the surprisingly dark, angry song “Prayer in C” by a duo called Lilly Wood and the Prick (for real). Yes, Mark admitted which duo member he was playing. 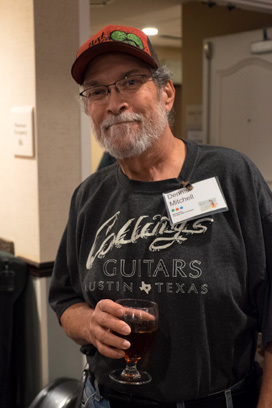 Ed Dowling has been coming with his wife Sally to our Gatherings for many years – I don’t know if I could take an HGG without them. 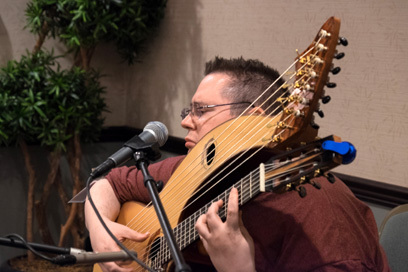 And Ed always has one of his strange custom harp guitars (or two) with him (this is his Tonedevil steel string “arch guitar”). 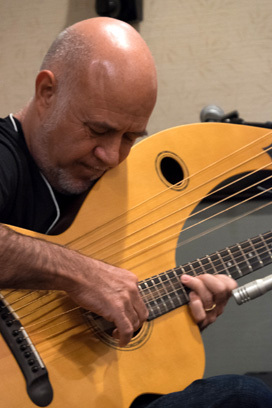 But Ed, a great musician, has never been brave enough to play for us…until this year! He dazzled us with fantastic bottleneck, thumping away on the subs. 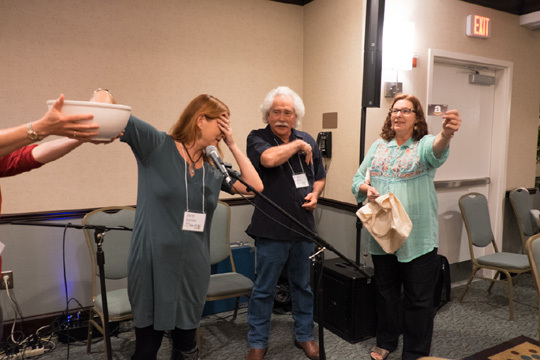 Once he had a taste, we couldn’t shut him up! He had to come back and play some cool slack key-style on his other nylon-string Worland arch guitar! 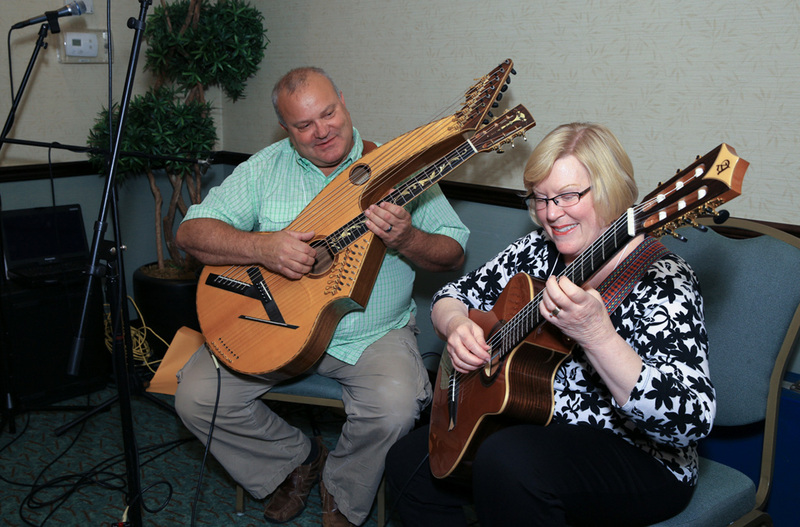 Tony Barnard, my Guest Blogger, who came all the way from London for his Gathering…even without an instrument! 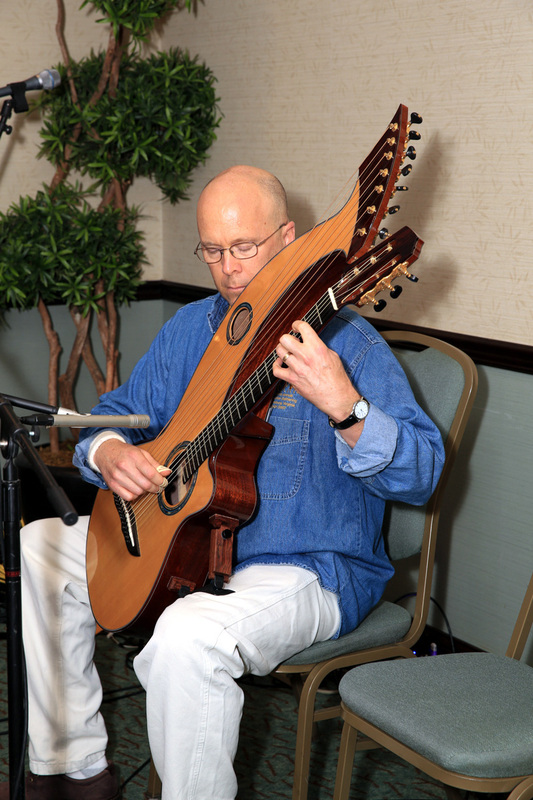 Here he plays on a New Dyer borrowed from Stephen Bennett. 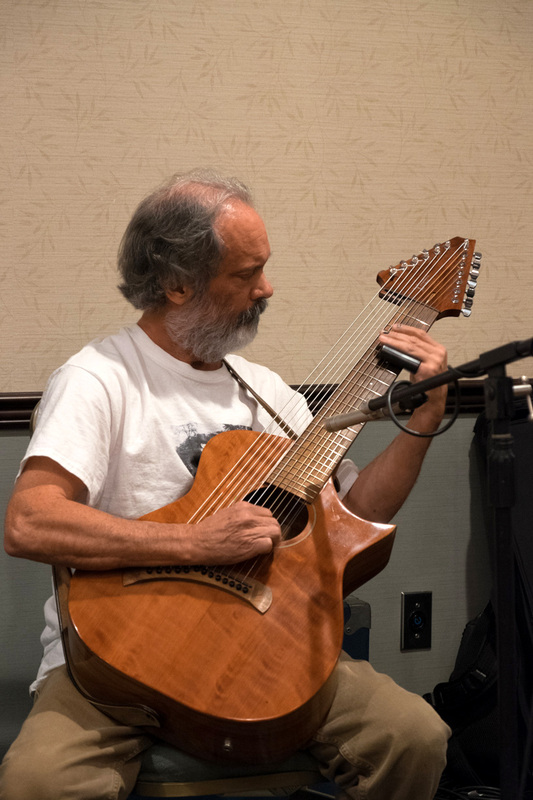 Attending his first-ever Gathering with his wife Dana, John Riley is an old pen pal of mine, being something of a harp guitar collector himself (he showed up with almost half a dozen!). 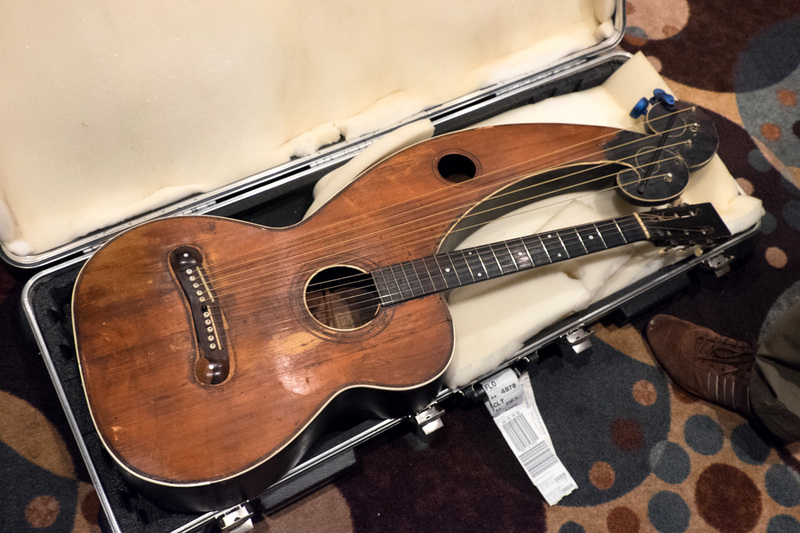 This is his incredible 1920s Coulter 12-strings on the neck HG that he restored himself. 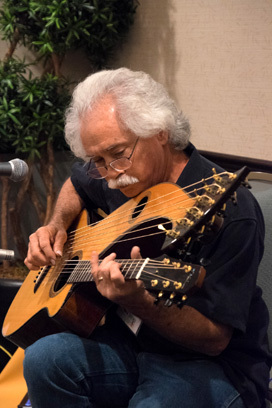 It sounded great, as did he – playing and singing. 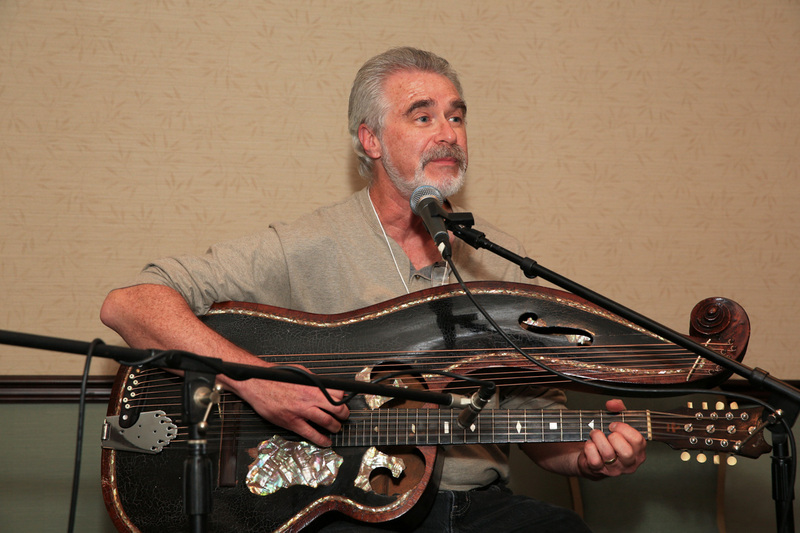 A great entertainer and a great guy. 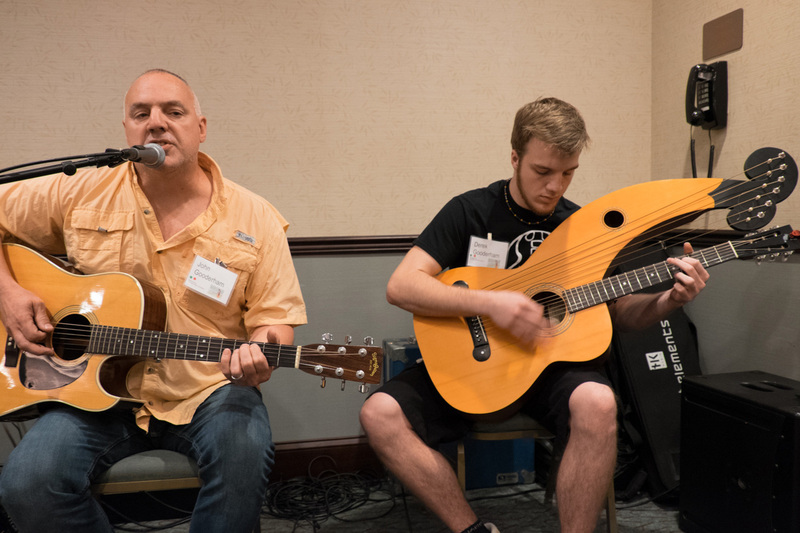 This was surely our biggest year for Newbies! 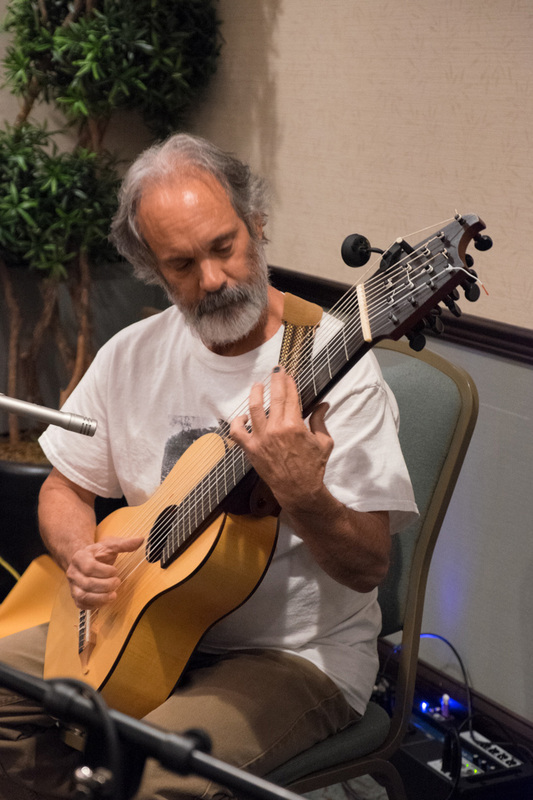 Though Dan Schwartz (on his beautiful Hoffman HG) was automatically family – he not only went through the Milwaukee John Stropes course with Frank Doucette, he was on a Narada CD compilation with Stephen Bennett! 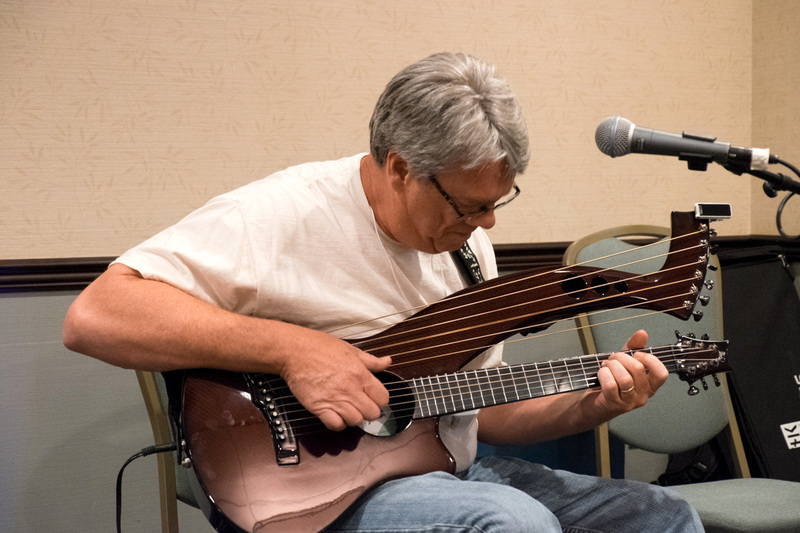 That was on 6-string, of which he is a master (also lap steel Weissenborn guitar). In short order, he’s become a harp guitar master as well. And he’s a sweetheart, as good as they come. Jody Butler came to her first HGG as well. 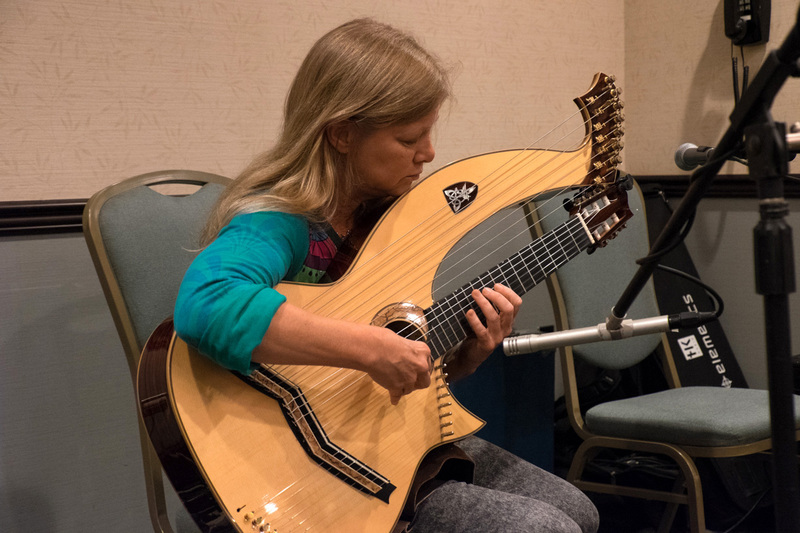 She’s already got her technique down on the David Taylor harp guitar she acquired from Muriel Anderson. 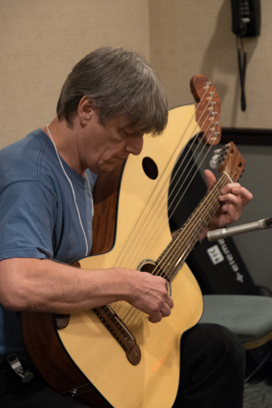 Pete Bradshaw (with one of his Wingerts) – another guy who shows up every year with a great new arrangement – in his case, usually a beautiful classical piece he arranges for steel string HG. Mark Farley is a serious student of the early romantic harp guitar repertoire, but like Pete, prefers to play it on the “wrong” instrument, in this case a modern nylon string harp guitar with super-trebles and many more sub-basses than were common back in the day of Regondi, a 2-bass (8-string guitar) virtuoso, who’s impressive piece Mark played. …and catching up with old friends, like luthier Dennis Mitchell who’s back to the Gathering after surviving a particularly nasty esophageal cancer. And checking out all the instruments as well. This wonderful eyesore is Drew Baldwin’s Dyer. A total disaster that suits his act beautifully! Back to the music, with Muriel Anderson starting things off. 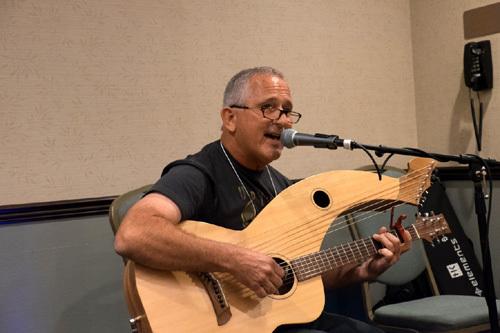 Bruce Labadie, with his Tonedevil, sang an original love song to his wife, Cindi. We were glad to have them both back after a hiatus! Our youngest Newbie of the weekend! A true newbie, Noah Altritt had just got a Buckey and was already writing tunes! Paul Price, playing jazz HG on his carbon fiber Emerald harp guitar. 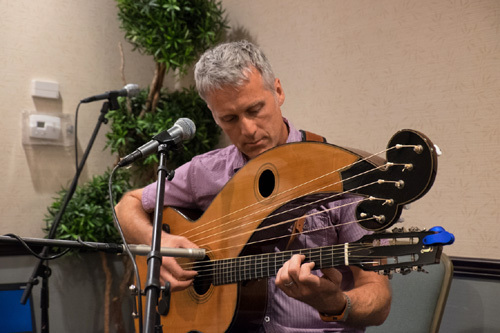 Our founder (and no slouch on harp guitar), Stephen Bennett plays a new tune on his Wingert. And to wrap things up, also playing a Bennett tune (on his Karol) was our talented host, Randall Sprinkle! We got kicked out of the banquet room, but not the lobby! Party and jam til the wee hours, as always! 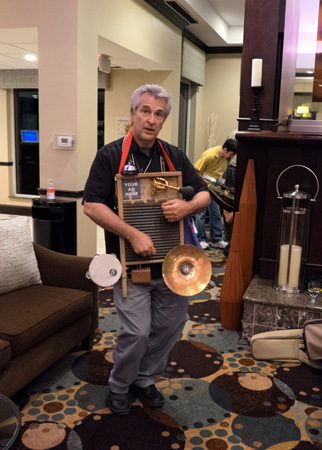 Where Ed Dowling surprised me with this gift…my very own novelty washboard! I proceeded to have a total blast, even if no one else did! Being our second HGG I can say with no reservations we had an absolutely fabulous time. 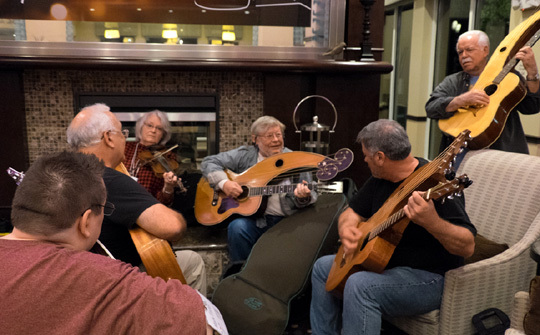 The playing and camaraderie were second to none. 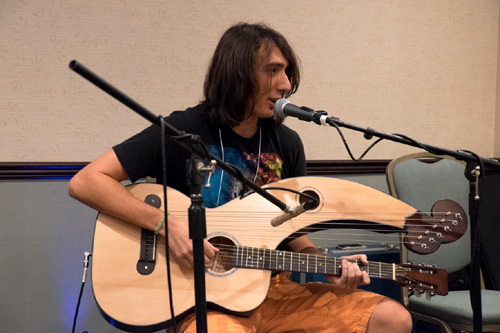 Reading the blog and seeing the photos brings it right back like it was just yesterday! 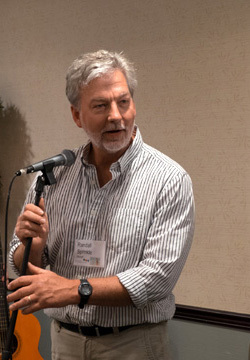 Thank you Sir Gregory and can’t wait for next year at HGGXIV! 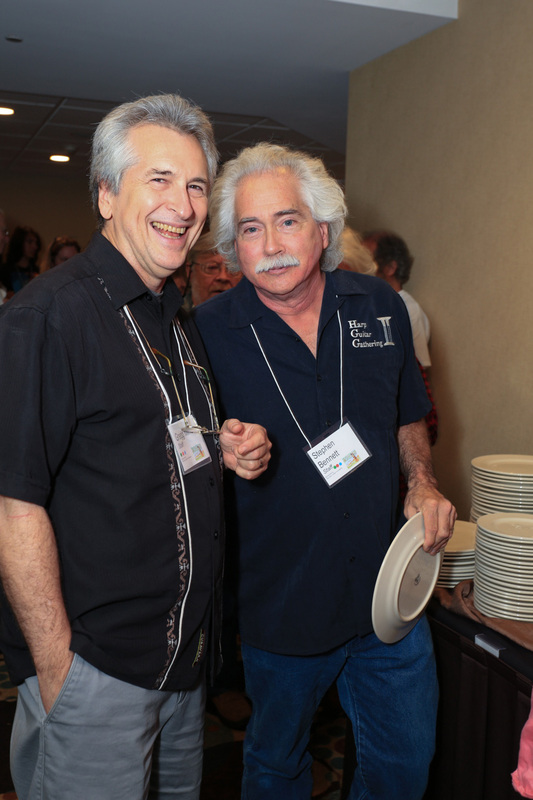 Thanks for the great pics Sir Gregg, and of course Chuck for taking and sharing them. Great Memories, see you all next year.